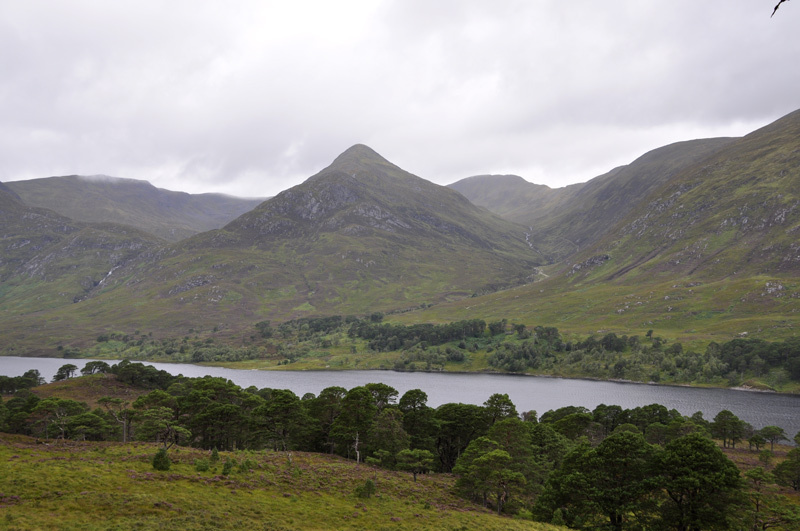 Mam Sodhail and Carn Eighe are twin peaks on a crescent shaped ridge of mountains which enclose Gleann a' Choilich. Mam Sodhail has a triangular pyrimidal summit cone at the convergence of three ridges. The longest ridge runs ESE 3.5km to Sgurr na Lapaich (1036m, not the Munro!) and is a possible ascent route. To the N a short narrow ridge connects to Carn Eighe. The third ridge (SSW) leads to two longer ridges (SE) which enclose Coire Leachavie and Corie Coulavie. A path in Coire Leachavie ascends to the SSW ridge 500m from the summit. 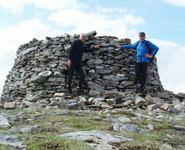 The massive cairn at the summit of Mam Sodhail. Apparently this was the first triangulation point used by the OS in Scotland. March 2007. Mam Sodhail from Sgurr Na Lapaich , Carn Eighe clouded over . The summary information of one or more ascent routes that include Mam Sodhail. 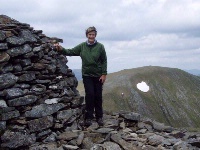 1 1994 m 32.05 km 10 hrs Carn Eighe, Mam Sodhail and Beinn Fhionnlaidh [Glen Affric] Strenuous route with good approach path but some steep slopes to ascend. Roy and John at the big tower in sunshine. 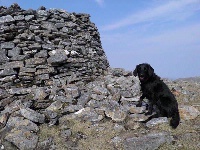 A rather windblown Wee Black Dug at the summit of Mam Sodhail. April 2011. Post a few words about Mam Sodhail or read what others have had to say. Great day but a long one. Here is one good tip to avoid climbing carn Eighe twice. One the col is reached between Sodhail and Eighe, contour down and around the boulder field to reach Stob Coire Lochan. 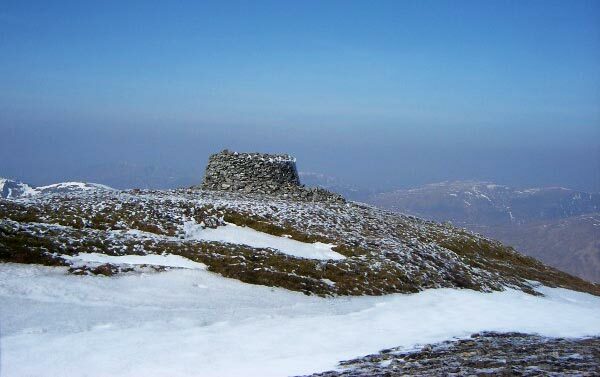 Then climb Fhionnlaidh. Then return and climb Eighe. It saves climbing Eighe twice. 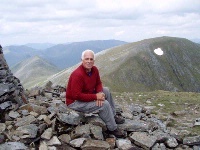 Enjoyable day, I went up Sgurr na Lapaich first along the ridge to Mam Sodhail, I was glad I did this as I gained some height early rather than the guide book idea of going up Gleann nam Fiadh. I then traversed by Carn Eige to save a bit of climbing before returning to it after Beinn Fhionnlaidh and then along the fine ridge before coming off from the 1131 top which took some time in the snow. Take time finding a crossing point of the river on the way back, I got bored trying to find one and ended up just jumping in. The route over Mam Sodhail, Carn Eighe and Bheinn Fhionnlaidh is a long but rewarding day. A bike cane be used up to the foot of Sgurr na Lapaich before taking the good path up towards the top of Mam Sodhail. 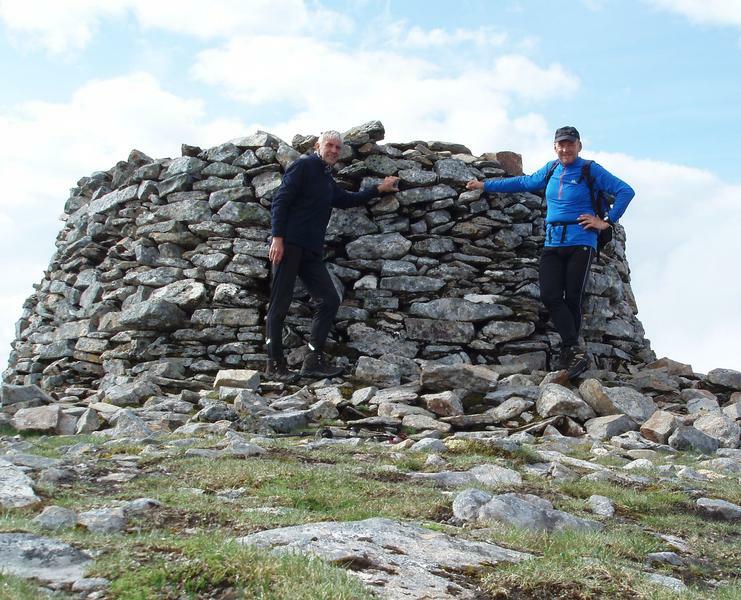 The last part of the ascent becomes quite rocky but once at the giant cairn all the effort becomes worthwhile with great views of the Afrric and Mullardoch hills. 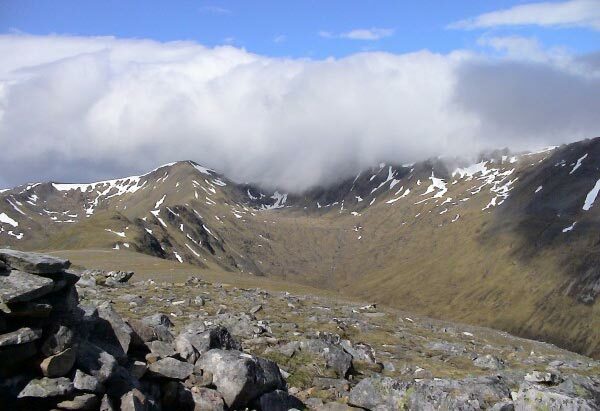 Carn Eighe is less than an hours walking from the summit and to inlcude Findlay's hill will require a tiring re-ascent of either of the aforementioned peaks.